I feel like this is such a Sunday recipe. This is honestly one of my favorite recipes and it’s so easy. 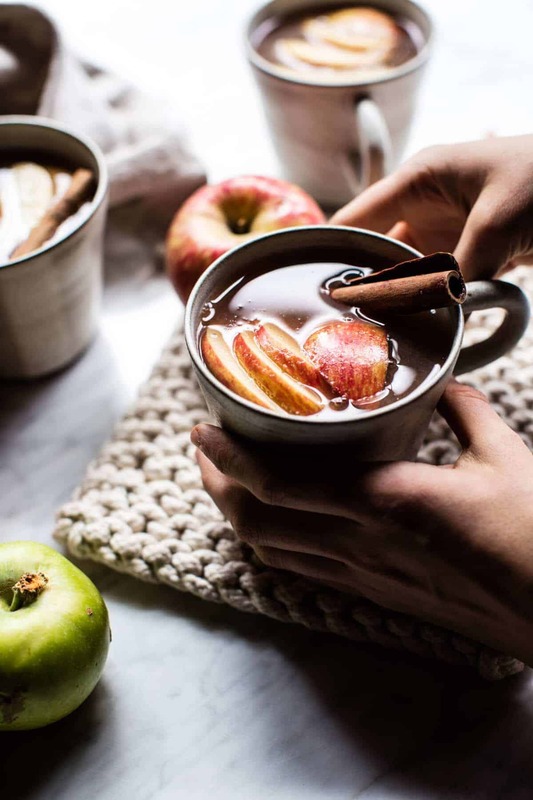 You really only need fresh apples and water to make cider, but I added a little cinnamon and maple for an extra flavor boost. 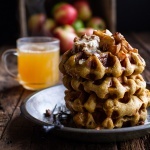 I love the sweetness and autumn flavor the maple gives this cider and of course cinnamon is a must! Oh, and I threw in a pomegranate too. I felt like the addition of a little pomegranate juice could only make this cider even more delish! I used a crockpot to simmer down my cider, and cook it low and slow all day long. If you don’t have a crockpot, you can simmer the cider on the stove-top and then strain as directed. 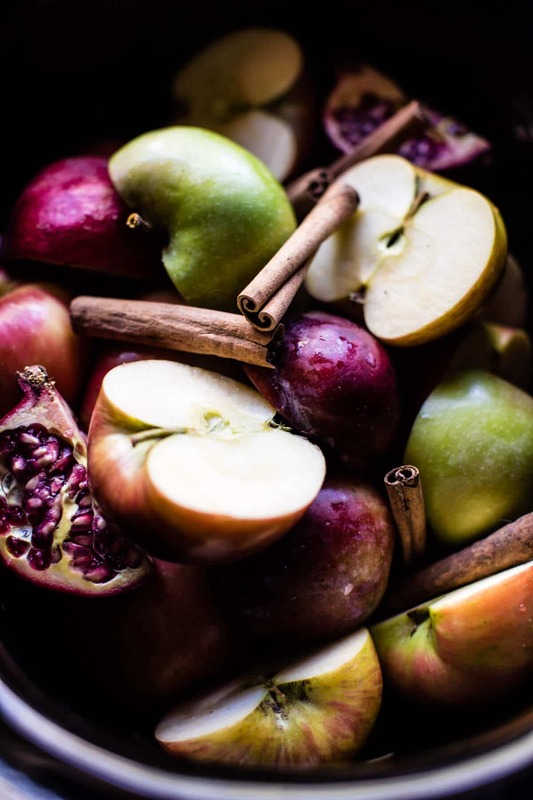 If only I had some of this cider to sip on now as I sit here typing this! I’ve been working away all weekend on cookbook edits so my eyes are feeling a little weary at the moment. Too much computer screen time for sure! Today though, I have major plans to do some filming for new recipes videos for HBH. Hopefully I’ll get to spend a little time with my oldest brother Creighton too, who flew into town for my brother Red’s movie premiere in Aspen. I made Creighton his favorite gumbo for dinner on Friday night, complete with beer bread and cookie dough for dessert! It was the perfect meal for the first super cold night of year, and we all loved it. How about you guys? What have you all been up to this weekend? 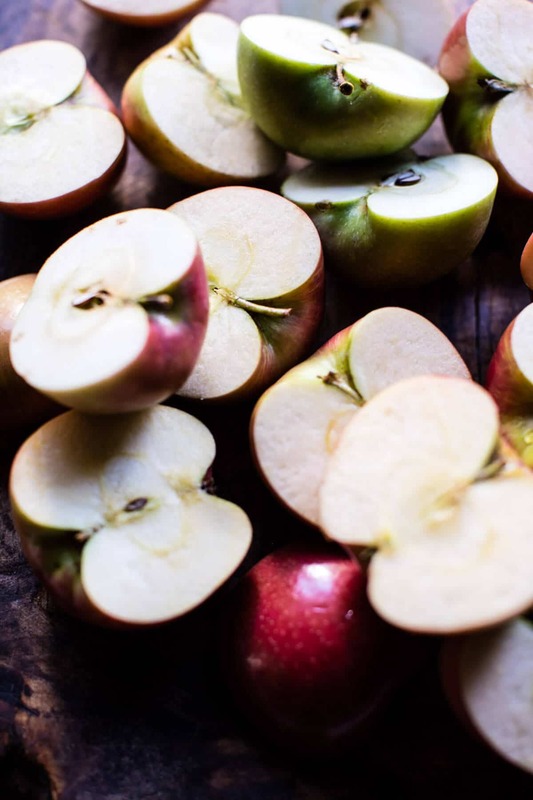 Hoping you maybe picked some apples fresh off the tree and are armed and ready to make this cider? Please say yes because you may not know it, but you really need this cider in your life this fall. 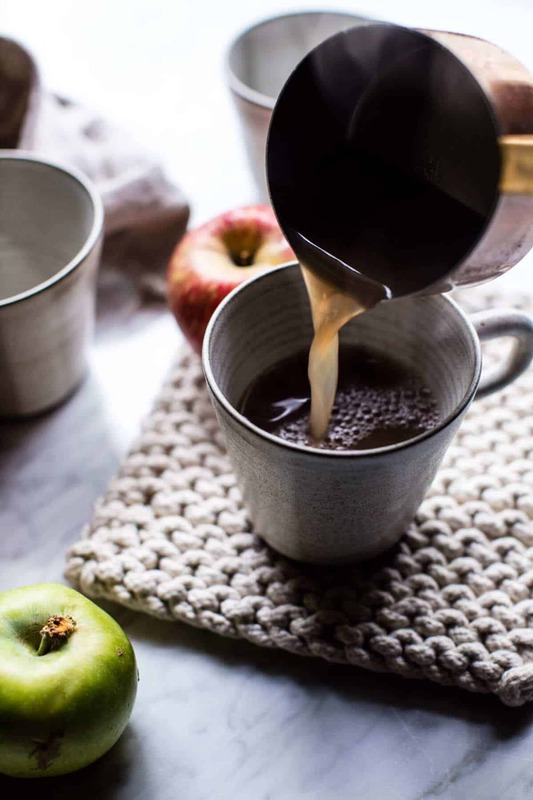 It’s basically fall perfection in a cup and is delicious both warm or cold. It’s also great when used in recipes like this apple cider chicken and these salted caramel doughnuts. 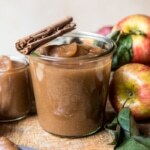 Add the apple, pomegranate, orange, cinnamon sticks and 2 tablespoons maple syrup to your crockpot. Immerse the ingredients with water (about 5-6 cups). Cover with a lid and cook on low for 6-7 hours or high for 4-5 hours. Alternately you can combine everything in a large soup pot and cook over medium heat for 3 hours or until the apples begin to break down. Carefully strain the mixture through a mesh strainer, discard the fruit and cinnamon sticks. If desired strain the cider one more time to remove any pulp. Taste and adjust the maple syrup to your liking. Serve warm or cold. Cider will keep for up to 2 weeks in the fridge. Oh I never knew making your own apple cider was this easy! Thank you for sharing, will surely make this one because like you said, we enjoy this fall drink both warm and cold. I wish though that I still have some of the apples from my cousin’s trees, unfortunately I used them all already. Oh well, I guess store-bought will do! 😉 I wish we had some of that gumbo and beer bread! Yay! I hope you love this Sheila! And store bought apples will work just great!? Thanks so much, Enjoy!! This would be amazing right now. And as I already said on IG when you posted the pic there: the third pic is such a great mood pic for fall. You should do more of them. Do you peel the apples and orange before putting them into the crockpot? This looks yummy! Nope, no need to peel! Let me know if you have questions. Thanks! YUM!!! So your brother Red is in a movie???? Hey Charlotte! Yes, Red is in a movie called “Insight”… There is a part out on him today on TWsnow.com if you want to check it out!! ? Awesome! I hope you love this one Natalie! Thanks! Haha thank you so much Julie! ? Saving this for the coming cold days. But curious to what movie Red is in?? Hey Nancy! Red is in a snowboarding movie called “Insight”… There is actually a part out on him today on TWsnow.com if you want to check it out! 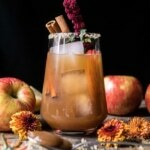 Truly the PERFECT fall drink. I love that you can have it hot or cold. I know pumpkin is your favorite fall flavor, but apple is mine! Awesome! Well, I hope you love this one! Thanks! I was Blessed with 50# of a new to me Red variety of Apples.. will buy granny’s to add to this and make some. I am wondering when done, if i could freeze it? or possibly can it? 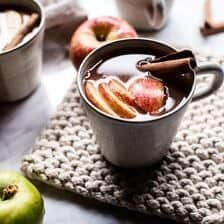 I am going to dry the apple slices, so I would have the option to make more of this cider later on..
thank you, tremendously anxious to try this Apple Cider our all time fav. Yeah! That is amazing! I have never tried canning or freezing this, so I really cannot say for sure. I would think freezing would be fine, but I have never canned anything so that I am really unsure of. Let me know how it goes. Thanks!! I love apple cider, and this version sounds soo amazing. I can just imagine how incredible the cider would taste with maple! Well I hope you love it! Thanks Andrea! OH WOW! Yum…… Such cozy vibes. Haha right?! Thanks so much Emma! Who would have thought that making your own cider would be this simple?!?! Right? I know! Thanks so much Mariana!? This sounds amazing! If I wanted to add alcohol to this to make it a warm cocktail, what would you suggest? Hi! I would go for bourbon and then maybe tequila or vodka? But bourbon would be best. Thanks! 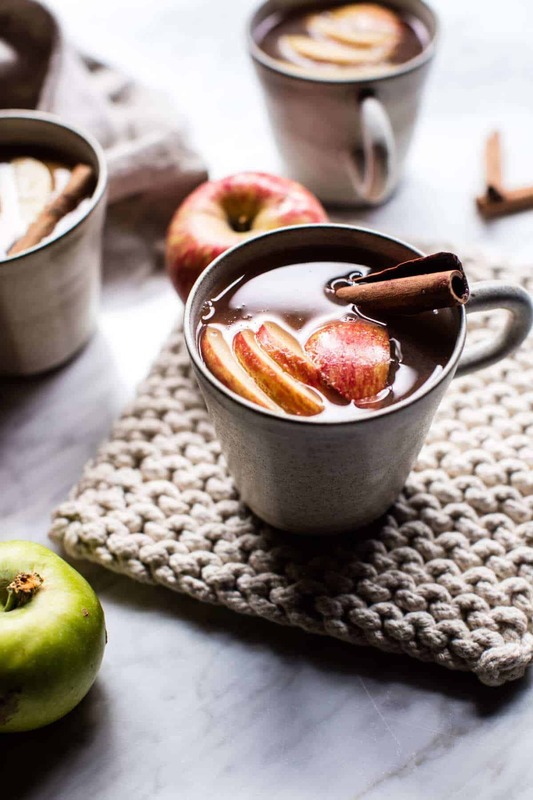 I’m so in need of a cozy mug of something… this cider is calling my name! Yay! I hope you love this one! Thank you so much Laura! I followed the recipe but mine came out a bit tart. I figure it’s from the orange peel or the pomegranate. Any ideas? Hey Corey!! Sounds like you need a little more maple to balance the tart fruits for your taste. I’d add 1 tablespoon at a time until it is just right for you! 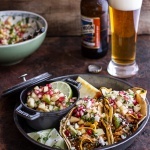 You can also remove the peels of the orange and pomegranate if you prefer. Let me know if you have any questions. Thank you! ? This is great! 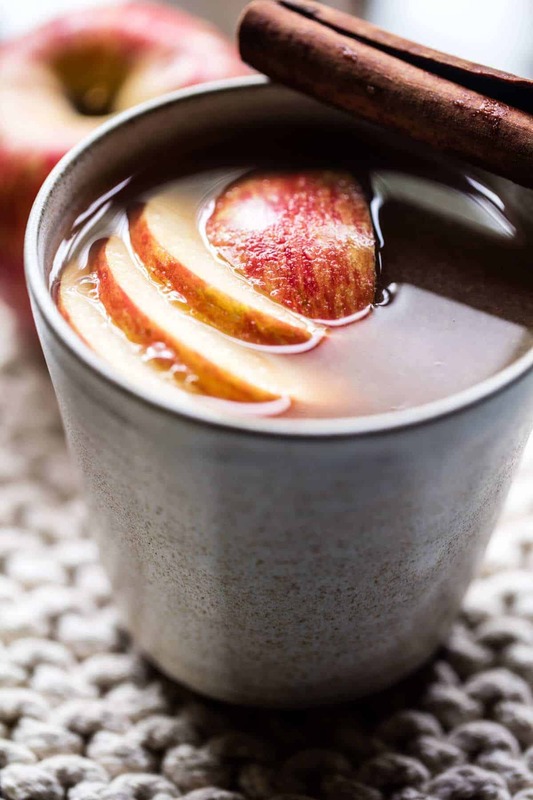 I didn’t know there was such an easy and delicious non-alcoholic alternative to mulled wine! Thank you for this recipe! haha! If it taste good I think it’s fine!! Looks PERFECT! I bet this cider would taste fantastic on any cold morning! Cheers!! The agave and honey was a good idea to help with the bitterness. Hope next time its much better for you, thanks so much for making it Jeff! I’m a little confused about the cinnamon. Is it supposed to say 2 cinnamon sticks or one response cinnamon? Hi Heather, it is 2 cinnamon sticks OR 1 teaspoon ground cinnamon. Please let me know if you have any other questions. Hope you love the cider! Hi Tieghan! Made this recipe today and my Kitchen smelled delicious! I used only large honey crisp apples, but I think I got confused by the instruction to “immerse” the apples in water and adding 5-6 cups of water. My apples were so large, that the quantity of water in your recipe was not immersing them in water, so I added more; a lot more! Therefore, my finished product tastes more like apple tea than a strong apple cider flavor. I’ve been trying to adjust it with more maple syrup and a good quality of apple butter that is dissolving in the hot liquid, but if you have any other suggestions, I’d appreciate it. I’ll definitely try this again with just 5 or 6 cups of water and see how it comes out. I did use the orange but not the pomegranate. Thank you for your help! Sadly I cannot have citrus, so will have to leave it out. Wondering if I could use my Insta-Pot for cooking. Any suggestions? We both are so fond of apple cider. Can’t wait to try it. thank you so much. Just made this today! My apples seemed pretty big so I used half the amount and, after they were soft, I went ahead and pureed the apples and strained them with my nut milk bag so I could get the most out of them 😉 The cider turned out very yummy. I barely needed to add any maple syrup because it was already sweet and flavorful! YUM! I am so glad this turned out perfectly for you Melanie! Thank you!